The leadership at Millersburg Electric was ready for a new logo. They’d been using their old one for years and it felt dated. Moreover, they found that it lacked the versatility needed to fit well in a variety of places: on signs, in print ads, on business cards, and more. Cassel Bear partnered with the team to develop a fresh logo mark that delivers a jolt. We also penned a new tagline, moving away from the generic “Electronics, Appliances, and More” to one which emphasized the company’s longevity and trust in the Holmes County community. This emphasis on who they are vs. what they sell would prove critical as we moved toward a new website. 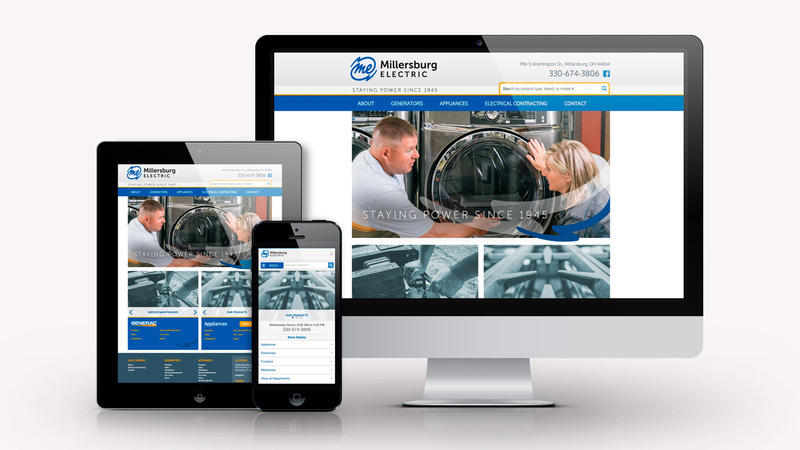 Millersburg Electric’s old website was cumbersome and hard to navigate, trying to encapsulate all the services and products the company provides – appliances, electronics, electrical contracting, generators, Radio Shack products, mattresses, and on and on. In all of this information about what, the story of who was getting lost. As Cassel Bear did research with ME’s customers, we discovered that what they valued wasn’t just the stuff, but the ethos of the place: trustworthiness, the over-and-above customer service, the responsiveness of the staff, the involvement in the community, and more. We had to find a way to tell this story and differentiate ME from the competition, especially the big box stores with bigger inventories. In a very unique partnership, Cassel Bear worked with a third-party web company that has crafted a special platform which cleanly and succinctly showcases retail store inventories – brands, products, prices. On our end, we wrote the Millersburg Electric story, captured photographs that showcase the friendly aura of the team, and crafted an invigorating overall design which then fit neatly into the third party platform. Now, Millersburg Electric has both the ability to demonstrate their robust offerings, while also telling the particulars of the people and history behind this very special place.